Four girls at a southwestern boarding school discover they have amazing feline powers and must unite to stop an ancient evil in this riveting adventure. Ana’s average, suburban life is turned upside down when she’s offered a place at the exclusive boarding school in New Mexico that both of her late parents attended. 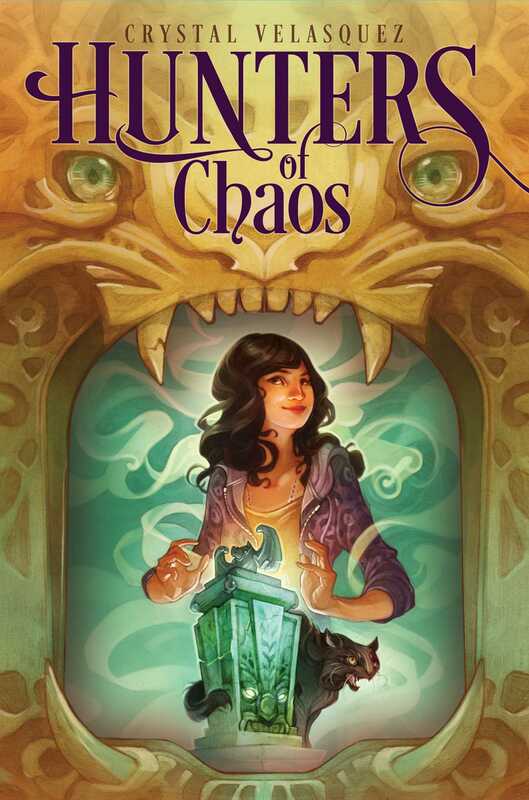 As she struggles to navigate the wealthy cliques of her new school, mysterious things begin to occur: sudden power failures, terrible storms, and even an earthquake! Ana soon learns that she and three other girls—with Chinese, Navajo, and Egyptian heritages—harbor connections to priceless objects in the school’s museum, and the museum’s curator, Ms. Benitez, is adamant that the girls understand their ancestry, and it’s importance. It turns out that the school sits on top of a mysterious temple, the ancient meeting place of the dangerous Brotherhood of Chaos. And when one of the priceless museum objects is shattered, the girls find out exactly why their heritage is so important: they have the power to turn into wildcats! Now in their powerful forms of jaguar, tiger, puma, and lion they must work together to fight the chaos spirits unleashed in the ensuing battle…and uncover the terrifying plans of those who want to resurrect the Brotherhood of Chaos. The front doorbell was ringing. The sound must have pulled me out of my dream, which had been about . . . well, I couldn’t quite remember. But my legs felt sore, as if I’d been running a marathon in my sleep, and for a moment my room looked strange. For some reason, I’d been expecting plants and mud instead of lavender walls and thick gray carpet. My desk near the window was still covered in schoolbooks and glittery pens. The door to my closet hung halfway open, the insides as messy as ever. My aunt had been begging me for days to straighten it up, but I knew she would cut me some slack. Though my parents had died when I was barely old enough to remember them, Aunt Teppy never stopped trying to make it up to me. My aunt and uncle, Tepin and Mec Navarro, never had kids of their own, but they were better parents than most of the people in our little corner of suburbia. Without them, I’d be in some awful orphanage or bouncing from one foster home to the next. Instead I lived in a two-story house on a quiet block in Cleveland. I had my own room, all the books and music I could want, and two people who loved me. I always heard adults say that kids don’t know how to appreciate what they have. Not me: I was lucky and I knew it. A soft knock sounded at my door. “Come in,” I called. I looked over at the digital clock next to my bed: 10:12 a.m.
“You tell him I said hands off!” I cried, throwing my covers back and swinging my feet to the floor. “All right,” she answered, shrugging. “But he looks pretty hungry. . . .” She tsked as if my short stack was already history. Then she retreated into the hallway, closing my door with a grin. I laughed as I moved past him and entered the kitchen, my slippers making a shh shh sound against the tiled floor. “Morning, sleepyhead,” Aunt Teppy said when she saw me. “Morning,” I replied. I stopped to give her a quick peck on the cheek and parked myself in a chair across the island. She had her dark brown hair tied back in a loose ponytail, and she wore jeans and a formfitting white T-shirt. A glass of milk and a plate of warm pancakes were on the counter, waiting for me. She’d added a smiley face made of blueberries. I grinned. Aunt Teppy followed my gaze to the hand-carved mask that hung on the wall near the island. It was a square wooden face with holes for eyes and what looked like a row of brown fangs bared in a permanent grimace. She was always bringing home special finds like “Balam.” Unlike most of the homes in the area, which were decorated with store-bought art, ours was full of interesting Mayan artifacts that Uncle Mec and Aunt Teppy had collected on their travels or bought at auctions. They were pretty proud of our Mayan ancestry. Uncle Mec’s full name—Mecatl—even meant “lineage,” so I guess he sort of had to be into the culture. But he’d done a good job of passing that pride down to me. Every time they bought a new piece, they’d tell me its history and what it meant, and each story was cooler than the last. That’s how I knew the mask in the kitchen was made of cedar wood and represented magical transformation. That didn’t make it any less creepy, though. I angled my chair away from the mask and tried my best to ignore it. “Was that the doorbell I heard before?” I said. “Oh, right.” Aunt Teppy tapped her forehead. “I almost forgot.” She circled around the kitchen island and picked up a stack of mail from the basket by the front door. “It was Laura from across the street. The mailman put our mail in her box again.” She took a seat at the table next to my uncle and began her daily ritual of sorting through the mail with a sigh. “I swear, if I get one more Publishers Clearing House envelope, I’ll scream! Don’t they know how annoying . . .” As her gaze stalled on a creamy white envelope, her voice trailed off and the kitchen grew pin-drop quiet. Aunt Teppy held up the envelope and frowned. She was usually on the serious side, but the look on her face now worried me. Her skin had paled, and she seemed stunned, as if the envelope had spoken to her. I rose from my chair to get a better look, and was surprised to see my own name written across the front in elaborate black calligraphy. In the space where you usually see a return address was an embossed gold seal that said TEMPLE ACADEMY. He looked up from his newspaper, squinting his eyes at first as he read my name. Then when his eyes landed on the seal, they widened. “Is it time already?” he asked. “You didn’t think what?” I urged. “What is Temple Academy?” Anything that had them this wigged couldn’t possibly be good. But they remained silent, ashen faced. “C’mon, you guys. You’re really freaking me out now,” I said. On a scale of one to ten, my curiosity level was at about a hundred, so I tore into the envelope and pulled out a piece of heavy cream-colored paper, folded into three perfectly equal sections. “Dear Ana Cetzal,” it began. We are pleased to inform you that you have been accepted into Temple Academy’s matriculating class for the upcoming school year. As I’m sure you know, this is an honor bestowed on very few. . . . I looked up at my aunt and uncle, more confused than ever. “What is this?” I asked, holding up the letter. “Are you shipping me off to boarding school or something? Is this your way of saying that you’re sick of me?” I could hear the panic in my voice, but I couldn’t help it. I glanced at Uncle Mec, who said, “Eh,” lifting one hand and teetering it back and forth like a seesaw. I held my breath. I never asked my aunt and uncle too many questions about my parents because I was afraid they’d think I didn’t accept them as my parents. Plus, Aunt Teppy always looked so sad when I mentioned the sister she’d lost. But now that she’d brought it up, I couldn’t wait to soak in any information she offered me. I tried to picture teenage versions of my parents running through dim school hallways hand in hand, laughing, sneaking kisses beneath stairwells. If that was their beginning, then it was mine, too, in a way. The two of them shared a guilty glance before Aunt Teppy said, “I think we were in denial. If it were up to me, you’d live with us until you were old and gray.” She picked up the letter again and read it over. It might have just been the angle of her head in the sunlight, but I think she was tearing up. Uncle Mec just kept gazing out the window and sighing. “Well, then your aunt and I would take the money and buy that yacht we’ve had our eye on at last!” said Uncle Mec. They shared another long glance and my uncle shifted uncomfortably in his chair. “Listen, Ana,” Uncle Mec said, his voice not quite as confident as he probably hoped it sounded. “We didn’t mean to give you the wrong impression. We’re just two selfish old people who want to keep you close to us. But this”—he held up the letter—“is good news, not bad. Temple Academy can offer you opportunities you’d never get at the local school. That is, if . . .” This time he trailed off and looked helplessly at my aunt. He seemed worried. If I hadn’t been staring at them so hard, I would have missed the almost imperceptible shake of Aunt Teppy’s head. “But, but what about—?” I tried. Aunt Teppy clapped her hands. “Chop chop, Ana. Hurry up and finish your breakfast. Big day ahead.” She rushed out of the kitchen then, and my uncle quietly rose from his chair to follow her, giving my arm a squeeze before he left. I took a seat in front of my now cold pancakes to try to finish my breakfast. I had eaten the bottom half of the circle, so the blueberry smile was gone. All that remained were two blue eyes staring back at me, looking just as lost as I felt. Two weeks passed in a blur and suddenly it was the night before I had to leave for Temple Academy. The weather seemed to feel as uneasy as I did. A storm had raged outside the house all day, rattling our windows and lighting up the darkness with occasional bursts of lightning. And there was so much rain, I started to wonder if I’d have to swim to the airport the next day. I looked around my room for the millionth time. Was it possible that in just a few hours, I wouldn’t be sleeping here anymore? I’d be somewhere in New Mexico surrounded by strangers and, if every movie I’d ever seen about boarding schools was to be believed, sharing a room with a clique of girls who would spend their time plotting my demise. I opened my suitcase again and took out the ratty stuffed cat I’d had since I was little. It was kind of my security blanket. But if I was going to be surrounded by snobby mean girls who’d make fun of me over every little thing, I didn’t want to give them any ammunition. Sorry, Whiskers. I put him back on my bookshelf. I picked up the small photo album I’d placed in the side compartment of the suitcase and sat on the edge of my bed, flipping through it until I came across a picture of my parents. In the picture they were in a park, knee-deep in snow. They had one long red-and-black scarf wrapped around both their necks. Mom, her long black hair tucked into a pink wool cap with a white pom-pom on top, was kissing Dad’s cheek. His eyes were closed, snowflakes settling into his lashes, and he had this silly grin on his face. It was a little blurry and off center, maybe because snowflakes were landing on the lens. But I could see that they had been young in the photo, early twenties, maybe. It was weird that I knew so little about my own parents. I knew that I looked like my mom, and Uncle Mec always said that I laughed just like my dad. But other than that, I didn’t know the first thing about them—except that for some reason, they’d wanted me to go to Temple Academy. Was that really where they met? I wondered. Just then I heard three soft knocks. My door creaked open slowly and Aunt Teppy peeked around the edge. “Mind if I come in?” she said. I waved her in and kept looking down at the photo. She came and sat next to me on the bed and looked down too. “Aw, that’s a great one,” she said, taking the album from my hands and laying it across her lap. “I think I actually took this picture. I remember we had so much fun that day.” Her voice broke a little on the last word and tears filled her eyes and slid down her cheek. This, exactly this, was why I never asked about my parents. “Jeez, Aunt Teppy, I’m not dying,” I said. “Just going to school. You’ll see me again in, like, two months, you know.” I tried for a light tone to cheer her up. But the truth is, I was just as sad. I’d miss them like crazy. She reached into her pocket and pulled something out. In her hand she held a leather necklace with a turquoise Mayan jaguar carving hanging from the end. It was a little bit smaller than my palm. I couldn’t help cringing a little. Talk about giving any mean girls ammunition to make fun of me. Nothing says, I fit in here, like a Mayan jaguar carving hanging from my neck. But I could see how important it was to my aunt, so I took the necklace from her and pulled it over my head. The carving was lighter than it looked, and the surface felt oddly cool against my skin. But I still hoped it wouldn’t be too hot in New Mexico for me to throw on a pretty scarf to hide my newest piece of jewelry. I felt guilty for even having that thought. She and Uncle Mec were super into the whole Mayan thing, and they always tried to make it clear how important it was for me to know about my Mayan heritage and to take pride in it. And I did. I actually loved hearing about the ancient warriors and seeing all the art they left behind. Knowing that I was connected to this whole civilization that archaeologists spent a lifetime studying was kind of cool. But, honestly, that all seemed like such a long time ago. What did those dusty relics in the history museum have to do with my life now? Other than the fact that my last name—Cetzal—was Mayan, I just didn’t feel the connection. But for my aunt’s sake, I kept that to myself. “I’m glad you like it,” she answered. “There’s one more thing.” She stood up and went out into the hall. When she came back into my room, she was carrying a large gift-wrapped box. She sat next to me on the bed again and handed me the present. “What—what is this?” I asked as I took it from her. “Something every student should have.” She smiled knowingly. But that night as I lay in my bed, listening to the sounds of the storm outside, I did nothing but worry. Crystal Velasquez is the author of the Hunters of Chaos series; the Your Life, but… series: Your Life, but Better; Your Life, but Cooler; and Your Life, but Sweeter; and four books in the Maya & Miguel series, based on the television show—My Twin Brother/My Twin Sister; Neighborhood Friends; The Valentine Machine; and Paint the Town. She holds a BA in creative writing from Penn State University and is a graduate of NYU’s Summer Publishing Institute. Currently an editor at Working Partners Ltd. and a freelance proofreader, she lives in Flushing, Queens, in New York City. Visit her website at CrystalVelasquez.com, her blog at YourLifebutBetter.Blogspot.com, or find her on Facebook at Facebook.com/CrystalVelasquezAuthor.